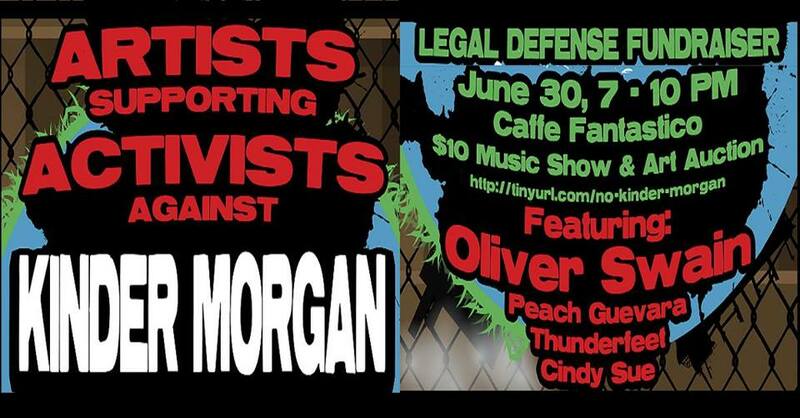 Help support those fighting the front lines against the Kinder Morgan Pipeline at this crucial fundraising event! The time is now to come together and support one another in our efforts to protect our coastal home, its many inhabitants, and this enchanting ecosystem teeming with diversity and abundance. Almost 200 people have been arrested on the frontlines of the expansion project on Burnaby Mountain, and the number will only rise as members of Indigenous Nations, water protectors and concerned locals continue to stand up against Kinder Morgan for the future of our climate, sustainable and forward-thinking energy development projects, and the generations of our children to come. For those residing on these lands there are many ways to help outside of front line resistance, and we can pool our funds and resources to help alleviate pressures on those willing arrest. Join us in celebrating some of the best qualities of humanity -- imagination, creativity, emotion -- through an evening of live music of many genres, art and artisan auction, and wholesome eats and drinks! DOORS OPEN at 7:00PM - please arrive early as there's much to come! If you're an artist or small business interested in donating to our auction, please email artistsforactivists@riseup.net! We'd love to showcase your item at this event! Mingle and relax while enjoying an opening performance by Cindy Sue! "Cindy Sue began writing music to sooth her "Global Grief" while drawing awareness to important issues affecting humanity, our habitat and all species. Her repertoire also includes the works of treasured protest singers like Buffy St. Marie, Ani Difranco, Sarah Harmer and Joni Mitchell." "Young wild wymoon Peach Guevara is a singer/songwriter and activist who writes her original folk-like tunes of love, revolution, and being human." We hope to see all you fantastic humans there! !